In July 2017 sixth formers Jaya Rathbone and Grace Oakley joined the Queer Beyond London project for two weeks of work experience. As part of this they undertook research on attitudes to People with AIDS in our case study cities in the Mass Observation Archive at the Keep in Brighton; collated a survey of the gay scene in each place from Gay Times at Bishopsgate Institute in London; and explored materials related to queer life in Plymouth. 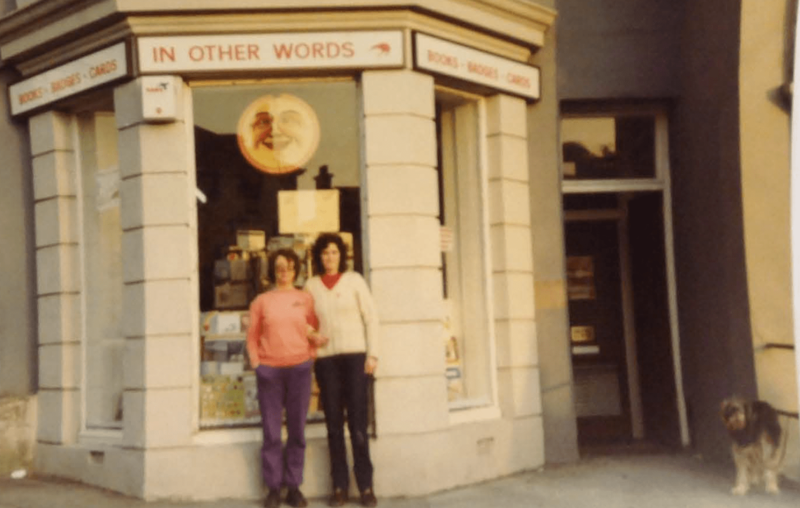 In this blog post they reflect on the latter – and specifically on the bookshop In Other Words which became an important queer hub in the city in the 1980s and early 1990s. Jaya and Grace are students at Stoke Newington Sixth Form. Jaya is planning to study History and Politics at University; Grace will study English Literature. This photograph is from a queer archive collected by the Plymouth “Pride in our Past” project. It depicts the In Other Words bookshop, and its owners Gay Jones and Prudence De Villiers who established the bookshop in 1982. The photo itself suggests something of the times. The badges advertised in the window were an important political tool and show the shop’s involvement in that world. The name “In Other Words” also implies creating an alternative narrative to social norms – in Plymouth and more broadly. In this blog we will attempt to determine the nature of the bookshop and suggest its local and national significance. Gay was working at the radical Grassroots bookshop in Manchester when she met Prudence, then a publisher’s representative. They subsequently moved to Plymouth to set up their own bookshop there. They aimed to support a wide range of people as demonstrated by their diverse stock of magazines, pamphlets, fiction and erotica, covering topics such as feminism, communism and anti-racism. In an oral history interview, Gay expressed her regret at their inability to stock books for or by the transgender and Asian communities, highlighting the responsibility they felt to support Plymouth’s marginalised groups. The recognition of these often-neglected people made the bookshop an obvious space not only for book buying but for the communities they served to seek “tea and sympathy” (as described by Gay). Particularly for those struggling with their sexuality, the bookshop would become a “safe haven” and was missed by many people after it closed in 2007. Gay attributes this personal significance to the fact that In Other Words was independent, and therefore not as focused on profit as commercial bookshops. Up until 2000, it was illegal to serve in the armed forces as an openly lesbian or gay person. For this reason Plymouth, a city with a large naval base, had a less coherent — or at least visibly coherent — LGBT community than other cities. This made the bookshop an invaluable establishment in the city, especially given the lack of a local gay press or listings. The diversity of material stocked in the bookshop and the fact that it was located away from gay bars meant that going there didn’t automatically identify you as LGBT. This was important to many in Plymouth whose work and family life might depend on not being ‘out’. Queer life in Plymouth often operated ‘under the radar’ (according to Alan Butler, who led the Pride in Our Past project). People thus often chose to turn a blind eye to LGBT material. Gay recounts the local paper describing them as “two friends running a bookshop” rather than as a couple, for example. The material that sparked controversy in Plymouth was the nuclear disarmament section – provoking a small demonstration by the young Tories outside the shop. This suggests that the LGBT community in Plymouth was perceived, at least by some, as a less urgent threat to this military city than the pacifist and anti-nuclear movement. Independent bookshops like In Other Words had begun springing up all around the UK, and Gay even described them as a “national movement”. They were often instrumental in supporting LGBT community as well as creating a space for radical politics to thrive and people to connect. For example the Lesbian and Gays Support the Miners group (LGSM) met and organised at Gay’s the Word bookshop in London’s Marchmont Street. These bookshops were also intergenerational and accessible, further allowing for the connection of different people, groups and political issues. The diverse content sitting side by side on the shelves helped suggest links between otherwise separate struggles. That Gay and Prudence saw their shop as part of a web of independent bookshops is also symbolic of a connected struggle: each bookshop had a different role and significance within its own community, but they were part of a connected countercultural movement in the 1980s. By looking at old photographs, newspapers and oral histories we attempted to preserve the legacy and significance of In Other Words. This legacy is also preserved in people’s memories. Some found their first queer community in the bookshop, others used it as a feminist library and a few perceived it as a threat to Plymouth’s naval power.